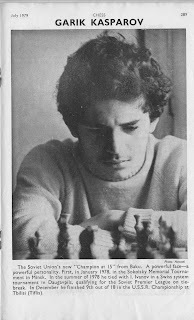 As Garry Kasparov struggles against Vladimir Putin's latest clampdowns on democracy, today's Chess in the Attic post remembers more carefree days back in 1979. 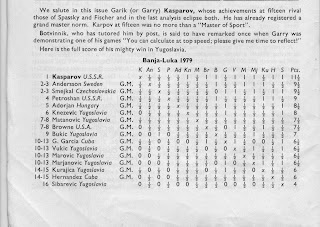 Garry Kasparov was just 16 years old and not even FIDE rated when he was invited to play in the Banja Luka tournament in Yugoslavia. His performance, winning by 2 clear points from a strong field that included former World Champion Tigran Petrosian and 13 other Grandmasters, was quite remarkable. This was Garry's first Grandmaster norm, he completed the title when he won the Baku tournament the following spring. Interestingly, despite the tournament concluding on the 2nd May, it wasn't reported until the July issue of Chess Magazine. Nowadays, in our Internet world, even having to wait a few hours for game scores and reports is considered poor practice.